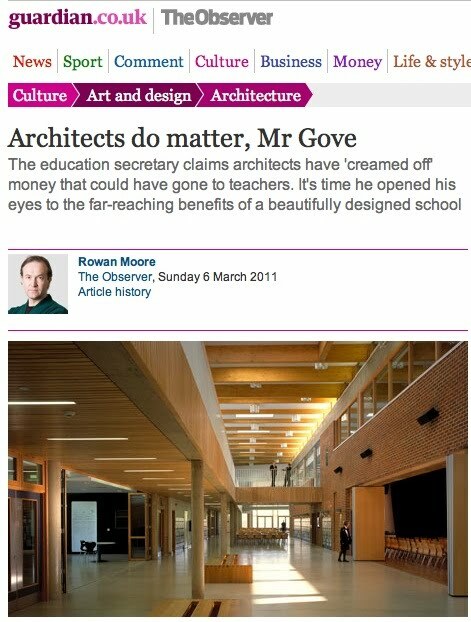 Gareth Long - Education: Architecture does matter! I am including this as a link to a very good article by Rowan Moore in today's Observer newspaper about the power of architecture in good school design. It also dispels some the often quoted myths currently being shouted about by some folk in power. I have always agreed that whilst the vision for BSF was fab, with every secondary student working in great learning environments, the BSF procurement method was bonkers and expensive - very expensive. But actually, why shouldn't our students learn in excellent specialist places designed for learning in the Third Millennium? Why would we want standardised schools that do not reflect the creativity and individuality of local areas and communities? To read the article in full click here.